A rewarding, fun and easy loop slicer that has a few rough edges and missing essentials, but comes in at a fair price. Good slicing. Drag-and-drop MIDI. Multiple outputs. Affordable. Per-slice effects. Limited file formats. No sample editing. It's been two decades since Propellerhead Software revolutionised loop sampling with ReCycle, and it's been a tough act to follow. ReCycle was so good when it first launched, in fact, that - a few bells and whistles aside - it remains largely the same program today. In the intervening period, many major DAWs and samplers now bypass it altogether, employing their own proprietary loop-slicing systems instead. With all that in mind, our first question regarding New Sonic Arts' new slicer, Vice, has to be: does anyone really need it? 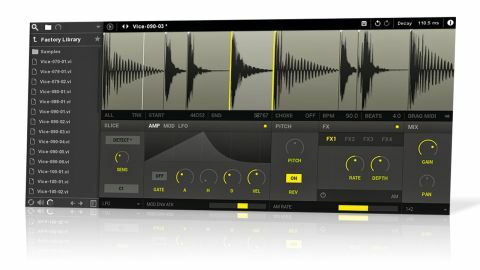 "Each slice has its own dedicated amplitude envelope, as well as a modulation envelope and an LFO"
Vice can operate as a standalone application or a plugin (VST/AU), and centres on a simple, clear interface. Simply load a loop in AIFF or WAV format and select a slice setting: transient Detect, fixed Grid (quarter-, eighth- or 16th-notes), Split (4, 8 or 16 equal-sized slices) or Manual slicing. The slicing is solid, with stereo loops exhibiting no audible zero-crossing clicks. You can also manually select a MIDI note to trigger each slice (with the option of having multiple slices assigned to the same key), and with your slices set, the triggering MIDI file is dragged onto a DAW track or your browser (in standalone mode). Vice is generally quite good at guessing the tempo of a loop and the number of beats (assuming it's 4/4), but when it gets it wrong, you can manually adjust both. Each slice has its own dedicated amplitude envelope, as well as a modulation envelope and an LFO. The latter two can be used to modulate the former (and each other), as well as the four FX slots available for each slice (see Vice squad). There's also a Pitch control for each slice (no fine-tuning, though), a Reverse function and eight Choke groups, via which slices can be set to silence each other (closed hi-hats cutting off open hi-hats, for example). There's nothing overly complicated here, but you get a good level of control, and it's all very productive and fun to use. As quick and effective as Vice is, there are a few things that we can envision holding people back from eschewing their DAW or sampler's loop- slicing in favour of this particular alternative. The first is the lack of any sort of mixer interface, for adjusting levels and pan, and soloing and muting slices. We'd also like to see the additions of MP3 import and the ability to highlight (and crop) discrete regions of samples and slice them. This sort of functionality is offered by most DAWs, and without it, Vice erects a workflow barrier that might deter some. Vice is an admittedly simple plugin, and it's likely that there's nothing here you can't already do in your DAW - but the same could be said of many third-party plugins these days, so we don't really mean that as an argument against it. What it has in its favour are quick, effective slicing, easy drag-and-drop MIDI functionality, and the tools required for slicing, mapping and resequencing loops in ways that you might have forgotten about or never bothered to try. So, although there's plenty of room for expansion and refinement, even as it stands, Vice is well worth a look.